Nothing speaks to the human experience as well as music. If you love listening to music and you’re nostalgic for a simpler place and time, you’ll appreciate our top ten list of the best record players with speakers. Our experts researched and reviewed a range of models to bring you a variety with different features to meet your needs. Whether you want a classic model or something more modern, we have you covered. Check out the specifications we outlined to help you shop. Let’s get started! 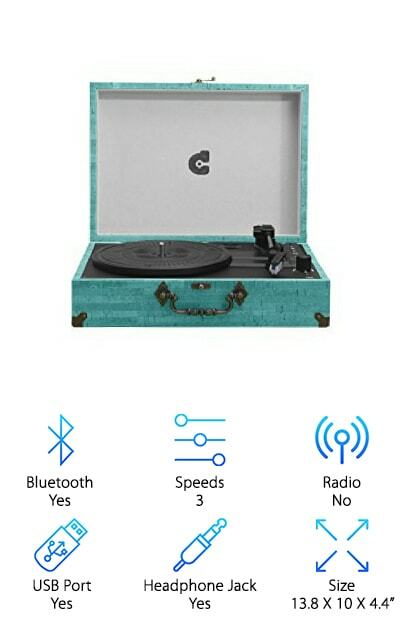 Bluetooth: This spec lets you know if the record player you’re eyeing allows for bluetooth connection to your other devices, so you can listen to all your favorite music from one convenient place. Speeds: This spec lets you know how many speeds each record player supports. Different speeds allow you to listen to your favorite records at varying RPMs. The best record players with speakers are equipped with at least two speeds. Radio: If the record player you like has a radio setting, we’ll let you know here. It’s always great to have the ability to switch to AM and FM for a larger variety of listening options. 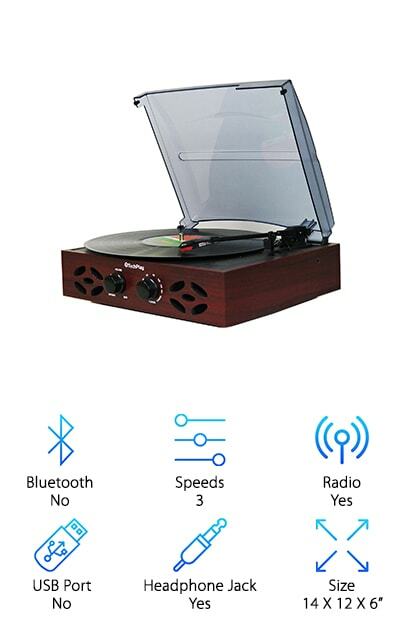 USB Port: Being able to physically connect your record player to your other devices is a great feature that lets you pass information between the two. USB ports also give you the option to record your music directly to a flashdrive! Headphone Jack: Sometimes you’re the only one who wants to hear the music from your record player. Additionally, if you plan to use the turntable professionally or want to learn how to deejay, you’ll need a headphone jack. Check this spec for the details. Size: We’ll tell you the dimensions for each record player on our list here, so you can pick the perfect fit for you. Some of our options are super portable! You already have a good idea of what you’re looking for. Now that we’ve given you some additional information to keep in mind, you’re ready to start shopping. We’ve done our homework to bring you the top 10 record players with built in speakers. Each model offers its own range of great features, so we know you’ll find the perfect fit. If you’re in a hurry, check out our top and budget picks first! Our top pick, Electrohome, has the look of a classic record player and is made from handcrafted wood with a mahogany finish. Its dual, full-range speakers and acoustically-designed cabinet work in harmony to fill your living space with music, making it our pick for the best record player with built in speakers. The Electrohome is equipped with a sapphire-tipped ceramic needle that preserves the integrity of even your most delicate records. 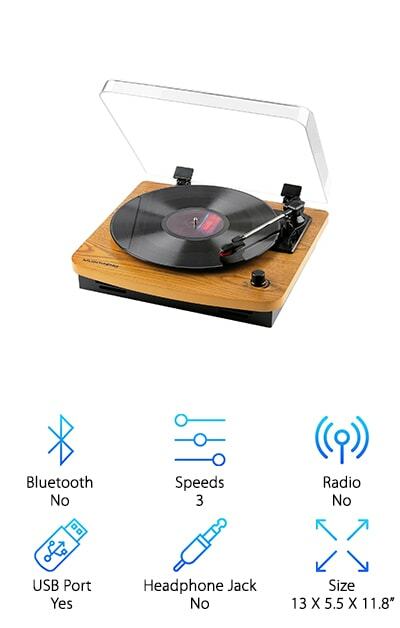 Speaking of, its belt-driven electric turntable lets you listen to all of your favorites, including your 7, 10, and 12-inch records and plays them at three speeds: 33 ?, 45, and 78 RPM. This nostalgic design is for show only, though, because the Electrohome also offers your favorite modern features. You’ll find a headphone jack, a port to connect your smartphone, and an FM/AM radio with an illuminated turning dial. Play your CDs and MP3s, too! Sold both with and without a USB port to record music, you’re given the option to pay just a little more for the port, so you can record music directly off your records and onto a flashdrive. With over 100 years of manufacturing top quality audio products, Electrohome promises the best and it delivers. Coming at you as our budget pick, the Jensen takes us back to the turntables of the 1980s and 1990s with its sleek, rad design and clear dust cover. Available in five different color combinations that utilize black, silver, gold, and turquoise, this belt-driven turntable spins all of your favorite records in three speeds. Beyond its neat appearance, it offers some of our favorite modern features, including a headphone jack, an AUX input that lets you connect your other devices, and a USB jack and cable for recording. Best of all, it hooks up to your home stereo system to instantly upgrade the feel of your set-up and contribute the power of its built-in speakers. As a stand-alone record player or connected to your existing system, these speakers really help you jam out. Convenient features like volume control, a power indicator, and an auto-stop switch let you listen in comfort and style. If you’re in the market for an awesome turntable at a great price, then the Jensen is where it’s at! We hunted for the best vinyl record player with speakers and ended up finding a deluxe model that you can pick up and take with you wherever you go! That’s right: the Victrola has a unique suitcase design that folds shut and allows you to carry it with you everywhere, thanks to a convenient handle. This classic turntable lets you listen to your vinyl records at three speeds from dual speakers. Even better, it features all your modern favorites and even boasts bluetooth connectivity from up to 33 feet away! The AUX jack lets you stream music from your other devices and a headphone jack gives you the option of private listening. Available to you in nineteen color options, the Victrola offers convenient control settings for comfortable listening, including a volume knob and an automatic or manual stop and selection switch. Plug it into your other stereo equipment to pump up the volume even more! The CMC Portable Turntable could easily be considered the best portable record player with built in speakers. Four full-range speakers on the body of the CMC stream your favorite music. 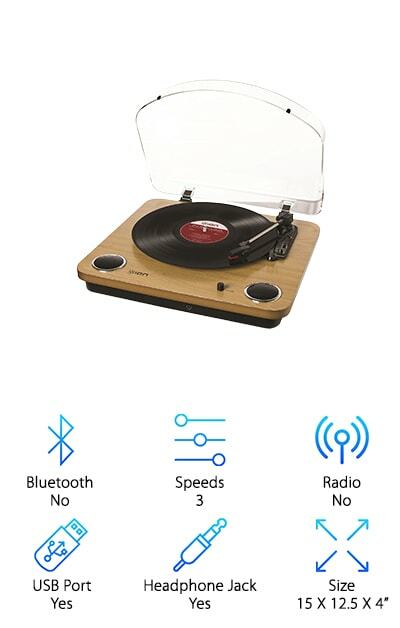 Play your old and new vinyl records or listen to music from any of your devices, thanks to this classic turntable’s bluetooth compatibility. Available in pink or blue in a beautiful briefcase style with a brass buckle and scalloped brass handle, this model is light and easy to carry, so you can bring it with you anywhere you plan to enjoy your music. CMC plays 7, 10, and 12-inch vinyl records in three speeds. It features an AUX jack to connect your other music devices and an RCA line out that lets you hook it up to your existing stereo system. Even better, you can record thanks to the SD and USB ports. Featuring a high-quality needle, multifunction controls, and a screen protector, this deluxe beauty is built to last but comes with a replacement needle just in case. The 1byone is a beautiful stereo turntable reminiscent of authentic 1930s and 1940s models. Encased in natural wood with a clear protective dust cover and authentic-looking speakers, it is sure to delight your nostalgic side. This record player features dual, front-facing 1.5-watt speakers that deliver a full range of crystal clear sound. Simultaneously, the belt-drive absorbs motor vibrations and noise to ensure top-quality listening.The front panel is also home to convenient buttons that let you tailor your experience, including a volume knob, power button, record button, and playback controls. A USB drive lets you record and store your vinyl music as MP3s. And what’s more: you can connect the 1byone to your home stereo system via the RCA-output. 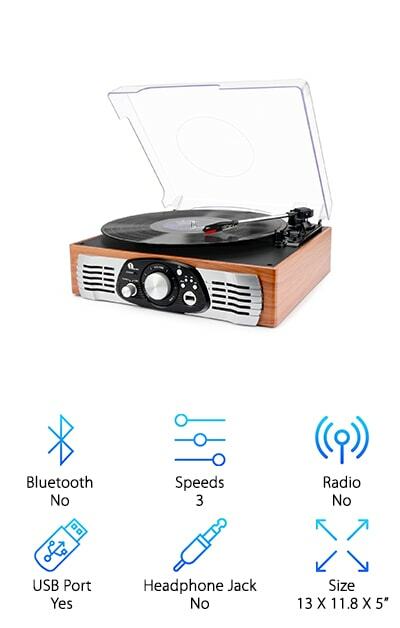 This quality record player with speakers comes with a complimentary twelve-month guarantee, so you can relax and enjoy the music knowing you made a smart investment. An all-in-one turntable available in natural wood and glossy piano black, the Ion uses a conical, diamond-tipped ceramic stylus and dual built-in speakers to bring all of your favorite vinyl tunes to life with crystal clear precision and depth. When our experts started their search for top rated record players with speakers, the Ion presented itself as a sleek and stylish model with all of the features a modern music aficionado would desire. Simple and easy to use, the Ion provides a headphone jack and AUX output to connect to your other music sources. The RCA jack lets you hook up to your home stereo system and pump up the volume for maximum listening. And get this: a USB port lets you connect to your computer and record. Best of all, the Ion includes an exclusive EZ Vinyl/Tape Converter software CD to guide you through converting your favorite songs and is compatible with both Mac and PC. If you’re in the market for a record player to complement your digital music collection on your hard drive, then the Ion is a perfect bet. 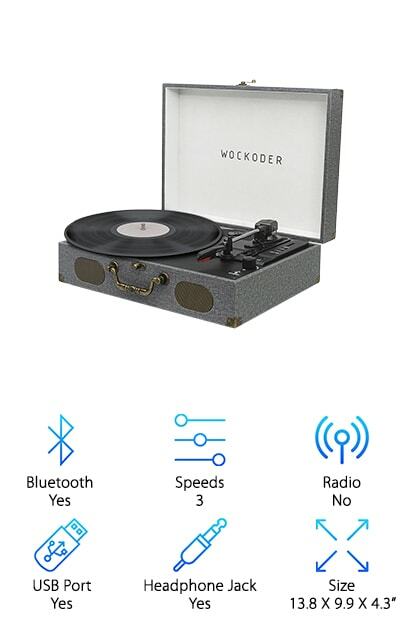 When our experts conducted their research to find the best record player with speakers reviews, the Wockoder presented itself as a top-rated model. This awesome turntable comes in six unique colors and a lightweight, easy-to-transport suitcase design. 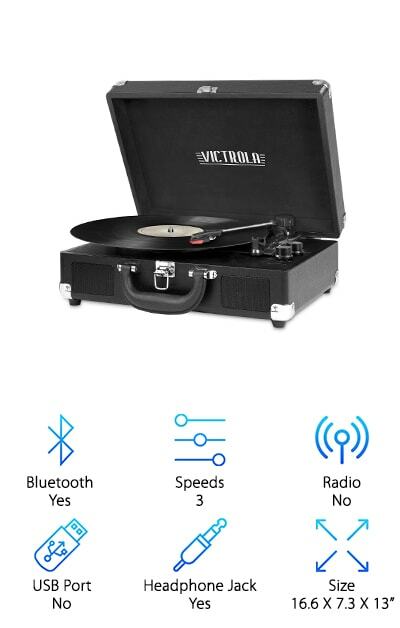 The convenient clasp and handle keep this record player tightly closed and allow you to bring your favorite vinyl music with you anywhere you go. It spins your old and new 7, 10, and 12-inch records at three different speeds and the high-quality built-in speakers make for a pure, harmonious listening experience. 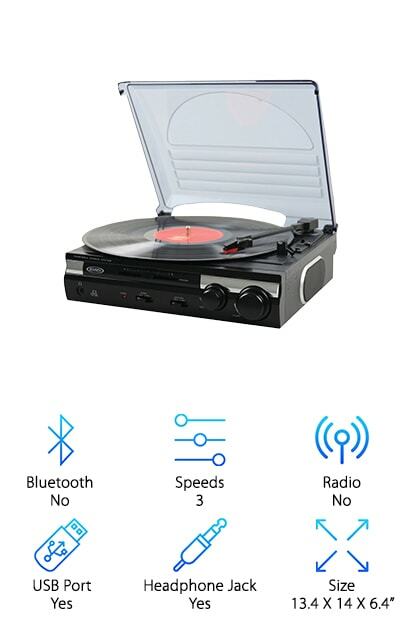 Equipped with bluetooth, an AUX port, and an RCA output, you can easily stream your favorite music from your other devices or hook this record player up to your home stereo system for maximum volume. If you’re looking for a great turntable that is easy to move and gives you a gaggle of modern features, the Wockoder has everything you want and more. Musitrend is committed to innovative professional design that brings new technology to the forefront of the music world, making it a best rated record player with built in speakers and a top contender on our list. The belt-driven turntable system operates with a ceramic stereo cartridge and stylus to bring you all the record player sounds you know and love. Equipped with two 3-watt built-in, top-quality speakers, you can jam out in style anywhere you like, thanks to Musitrend’s portability. 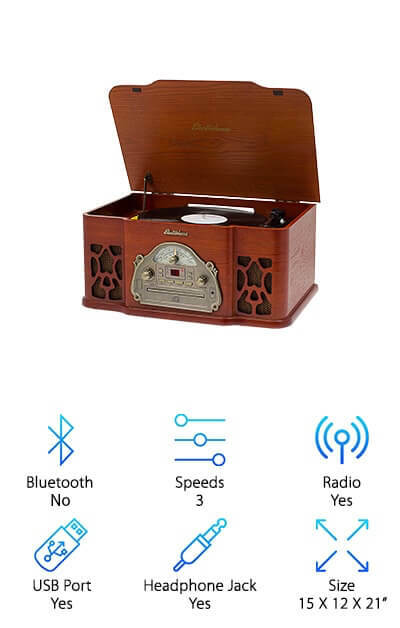 A classic design with modern bells and whistles, features include an AUX line in to connect to other devices, an RCA output to connect to amplifiers and home stereo equipment, and a USB port. Additionally, Musitrend is PC-compatible, so go ahead and hook up to your laptop or home computer! And it gets better! When you make this beautiful woodgrain record player your choice, you receive a complimentary backup stylus and a twelve-month warranty! The TechPlay brings you a stunning, antique record player with beautiful dark wood cut-out design speakers, so you can listen to your music in style and ambiance. The dual speakers give you just what you need when spinning your favorite music to relax. The RCA output lets you plug this turntable into your home stereo equipment or amplifiers to pump the volume up and get the party started. Play your 7, 10, and 12-inch records in three speeds: 33 ?, 45, and 78 RPM, and enjoy the classic, crisp sound of vinyl music. Equipped with FM radio and a headphone jack, TechPlay gives you listening options. Complete with a convenient dust cover to keep your unit clean, this simple, stylish model is great if you’re looking for authenticity. Easy-to-use and light enough to bring with you if you want to share your music, TechPlay makes our list as a best affordable record player with built in speakers. The Innovative Modern Turntable, manufactured by Victrola, delivers the brand’s commitment to distinctive craftsmanship and premium sound quality. Set apart by its powerful 50-watt stereo speakers, we think the Innovative is a top contender for best quality record player with built in speakers. Enjoy all of your old and new vinyl favorites with additional modern technology features. 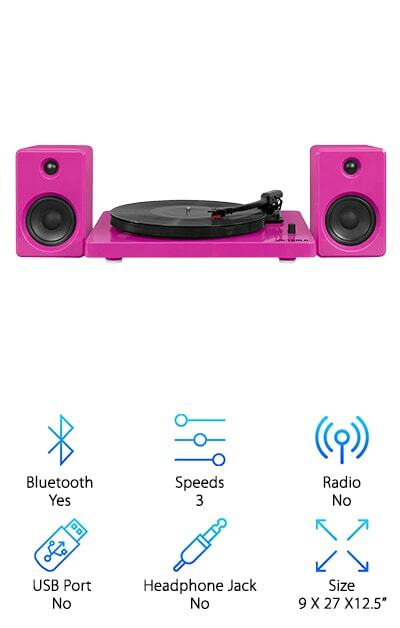 Bluetooth compatible, this awesome turntable boasts a range of up to 33 feet of connectivity for hands-free control and easy listening. RCA jacks let you hook the Innovative up to your home stereo equipment or additional amplifiers for maximum volume. The high-quality ceramic cartridge and needle deliver clear, appealing sound, helping you get into the music and relax. Available in seven colors with an attractive glossy finish, if you’re looking for power behind your sound, then look no further.